In Tuesday's quarterly earnings report, Apple declared that it had sold 11.42 million iPads on the quarter, generating $4.97 billion in revenue. In the last quarter, Apple noted 8.92 million units sold, with a revenue of $3.89 billion. In the year-ago quarter, Apple's sales volume was significantly less than this quarter, with 9.95 million units sold. Revenue was close to this last quarter's, with $4.88 billion gleaned from the device, mostly on the strength of the new 12.9-inch iPad Pro. 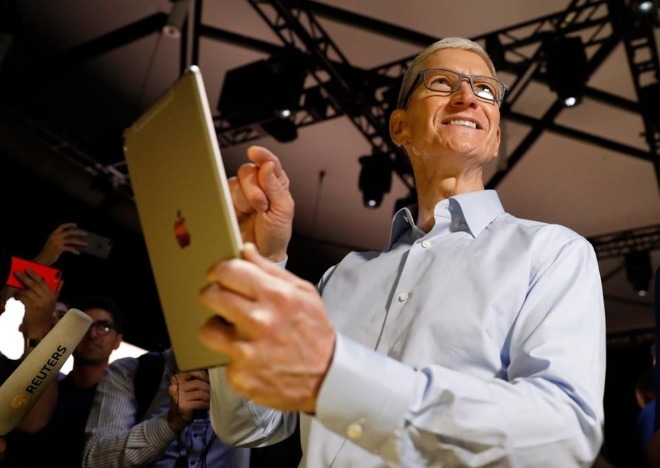 On March 21, Apple released the entry-level fifth generation iPad. The new iPad is the size of the original iPad Air, and features the A9 processor with M9 motion co-processor, and starts at $329 for 32GB of storage. The third fiscal quarter is the first full quarter of availability of the device. The 10.5-inch iPad Pro was revealed during the 2017 WWDC keynote, with the new mid-size offering in the line receiving a larger 120Hz refresh 10.5-inch display with thinner bezels, the A10X Fusion processor, while still weighing just one pound.